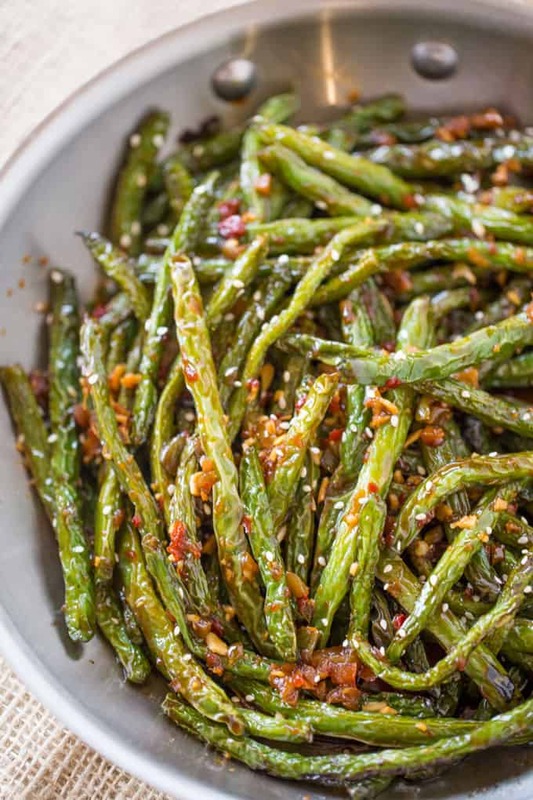 Spicy Chinese Sichuan Green Beans are the perfect easy side dish to your favorite Chinese meal and they’re a breeze to make with just a few ingredients. 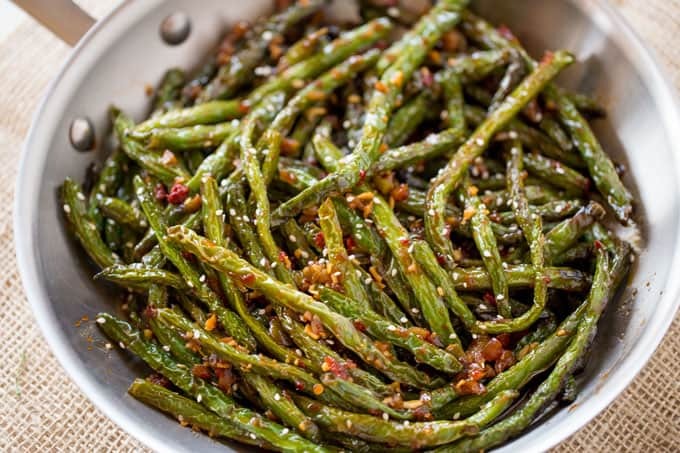 Spicy Chinese Sichuan Green Beans are a side dish you’ll normally find at your favorite Chinese food restaurant since most fast food restaurants don’t give you side dishes. The texture of these green beans are different than most steamed green beans you’ll find because they’re sautéed before the rest of the ingredients are added leading to the tender sort of shrunken texture you love but don’t normally get to have when you steam veggies or boil them for a couple of minutes to get them crisp tender. The method used for cooking these green beans is called dry-frying but in reality it is just about cooking them in a hot wok until they have the texture of being deep fried. Much less oil is used and wasted and the outcome is absolutely delicious. Plus even with the cooking ahead of time, within 10 minutes these green beans are completely done and ready to eat. They’re a similar style of green bean to the ever popular P.F. Chang’s Spicy Green Beans, the flavors here are not fermented as they are at P.F. Chang’s which lets the sauce ingredients rest overnight before being added to the pan. If you are looking for the P.F. Chang’s copycat recipe look no further than my friend Allyson’s blog at Domestic Superhero who has an amazing copycat recipe for the P.F. Chang’s Spicy Green Beans. 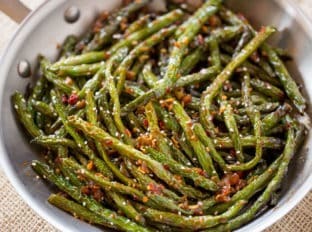 Looking for some Chinese Food to add to the menu to go along with these Spicy Chinese Sichuan Green Beans then look no further than this blog. 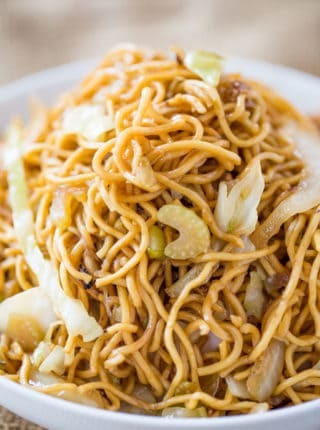 There is an entire recipe index for every single Panda Express Recipe on their menu. If you want P.F. 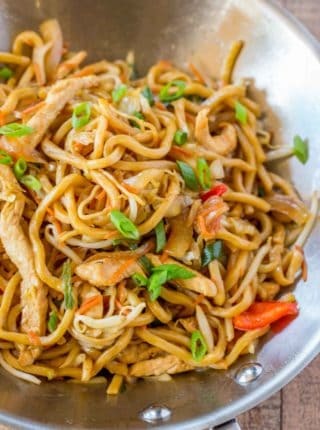 Chang’s recipes there are Chicken Lettuce Wraps, Garlic Noodles and Orange Peel Chicken. 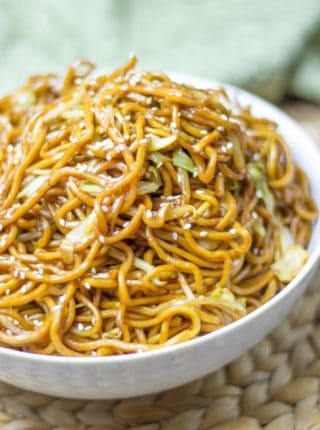 There are also a huge number of other Chinese Food recipes on the blog that aren’t copycats for you to enjoy. 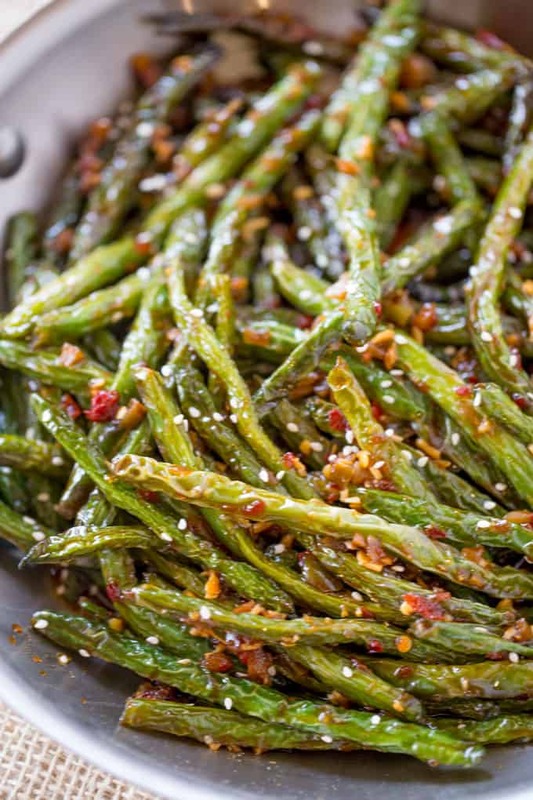 Basically make these amazing Spicy Chinese Sichuan Green Beans pick out a delicious main course and you’re on your way to a restaurant worthy meal. Chili Garlic Paste: This is like a non blended version of Sriracha, you can add it to the pan and it gives a heat while maintaining the little chunks of chili peppers you see in the photos. If you need to use Sriracha as a replacement it isn’t a huge deal but just realize the photos/food will look different. 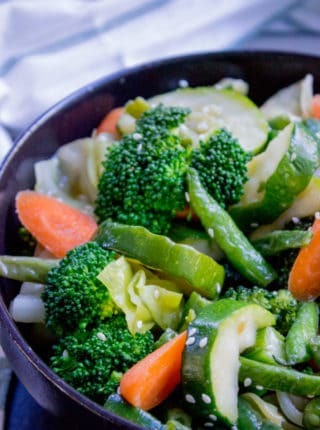 Rice Vinegar: There is a unique flavor to rice vinegar so I wouldn’t suggest trying to use a substitute. It is a tiny hint of a sweet flavor but also very mellow. You can find it locally in most grocery stores in the Asian food aisle and most Asian grocers will have 50+ varieties of it. Keep a bottle on hand, it has a wonderful flavor. 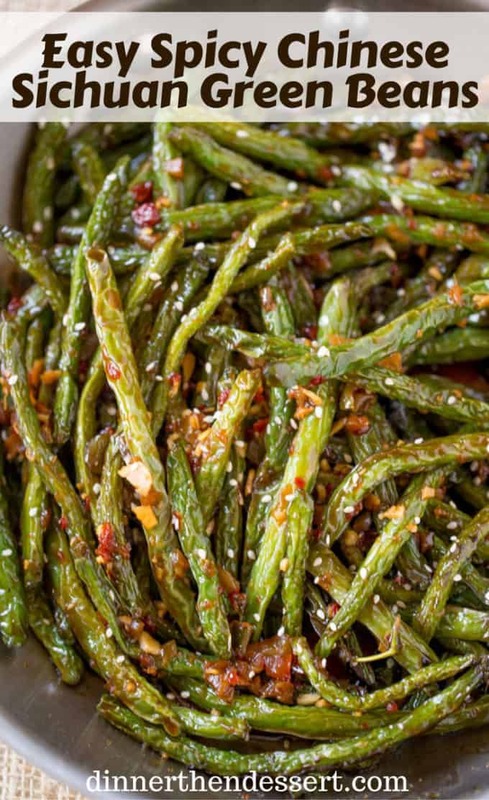 Spicy Chinese Sichuan Green Beans are the perfect easy side dish to your favorite Chinese meal and they're a breeze to make with just a few ingredients. To a wok add the canola oil and heat on medium-high heat. Add the green beans and stir fry them for 3-5 minutes or until they start to shrivel up a bit. Sorry to confuse you. You’re putting raw green beans in because you’ll be sauteeing them in the first step. Hope this helps clear this up! 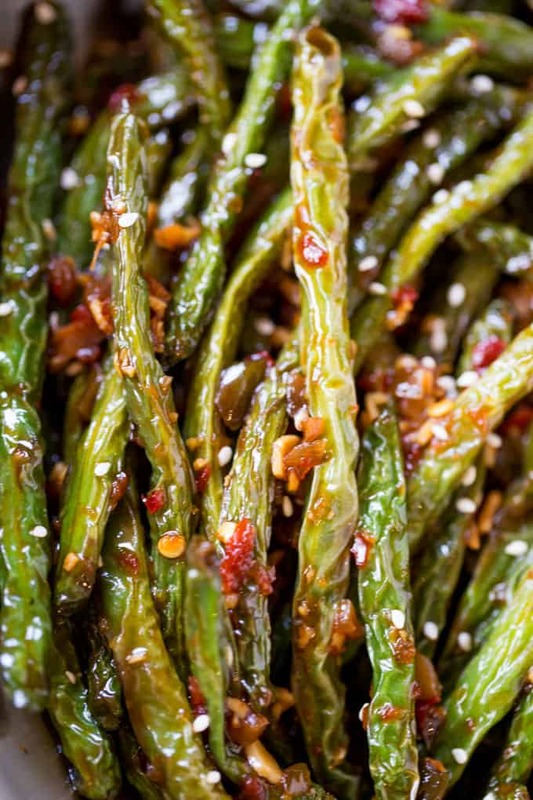 This is the best recipe for Chinese green beans ever – it tastes *right*, like the ones I used to get at the Chinatown places where nobody spoke English. May I suggest, for us lazybones cooks, that the beans be microwaved in an open container for ~6-8 minutes, rather than cooking entirely in the pan? Gives a dryer result and is a lot faster – you can be preparing everything else while they’re microwaving. So glad you enjoyed them! Thanks for the suggestion about making them quicker! I’ve made this several times using less chile paste. It’s lovely, easy and popular. Thanks for the tip, Ellen! So glad you like the recipe! Definitely my favorite vegetable side dish for just about everything ! So DELISH? So sorry about that. That must have dropped off! I just edited it to show 2 tablespoons of canola oil. Thanks for catching that! No, it’s just a grocery store green bean 🙂 I just looks for thinner ones. You could always use french green beans too (they’re thinner) but they’re usually more expensive. Looks yummy. How much canola oil do you use? Thanks Ev! I used about 2 tablespoons of oil in the wok. Enjoy! I’m seriously making these today!!! 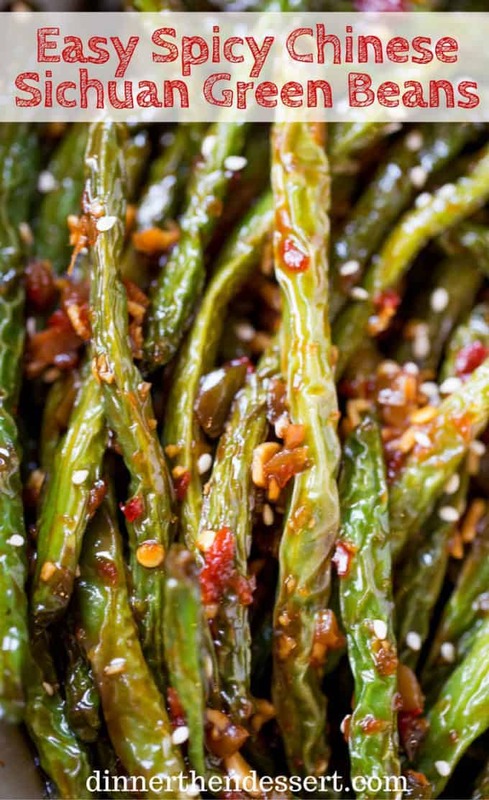 The best way to eat green beans! Thank you! They’re so good!! Me too! Bring on the heat! These look absolutely amaaazing!! I need to try this recipe asap! This is a great side dish! They look so tasty! I’m totally trying these for my husband! I’ve actually been working on that recipe recently, I am hoping to have it go live in the next month or two. Oh my gosh! I love everything about this!